Front-end web development to step up your game. Achieving a responsive layout can be pretty challenging when a design has elements with geometric ratios that should be preserved, no matter what the viewport dimensions may be. This is particularly true for square elements but also applies to any elements whose dimensions really make or break the aesthetic of a layout. 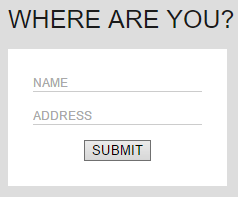 Styling forms with pseudo elements: can it be done? 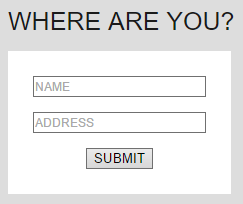 I was recently building a site that required a form with a very minimalist design. While styling the input fields, I discovered some interesting behaviour that I thought I should share. The design called for text input elements with simple underlines rather than complete borders or backgrounds that stand out from the rest of the form. Additionally, the design specified that an underline should increase in height when the text input element is in hover state. 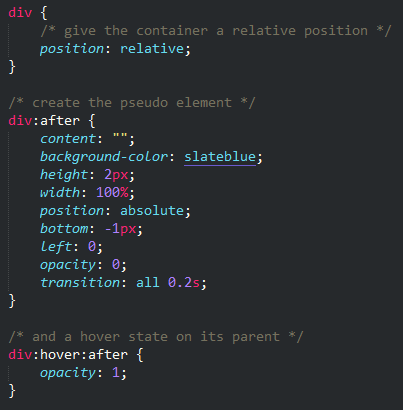 This is looking good so the last order of business is the hover state. 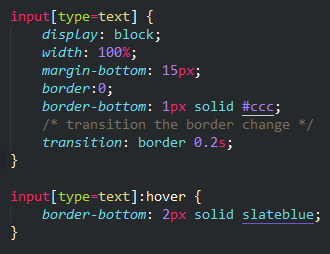 If we try to increase the value of border-bottom for input[type=text]:hover, we’ll notice that on hover, the input element grows taller by the difference between the original border width and the thicker one, causing the elements that follow to move. It’s pretty distracting and looks sloppy so this isn’t an option. So how can we achieve the border effect that we want without disrupting the layout? 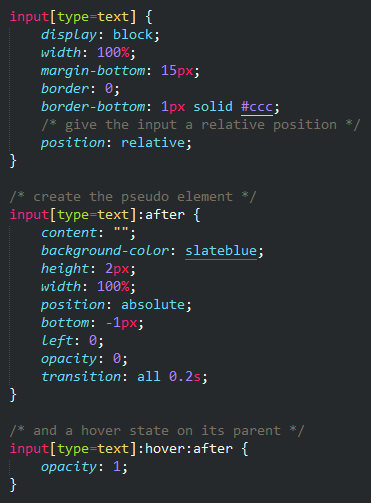 A common method for adding a decorative line to an element is to attach a pseudo element. The pseudo element is absolutely positioned, so its footprint in the layout flow is removed. Therefore, it does not disrupt the layout flow. Let’s try this technique. To position the pseudo element relative to the input element, we’ll first remove the transition from input[type=text] and the input[type=text]:hover rule that we added in the previous step. 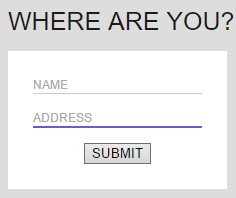 Next, we’ll set input[type=text] to position:relative. Then we’ll create the pseudo element by setting styles for input[type=text]:after and the hover state with input[type=text]:hover:after. attached to them, because they are empty elements and may not have any child nodes, like nested elements or text. The same goes for other elements which do not have closing tags, like <img>, <hr> and <br>. So what can we do? 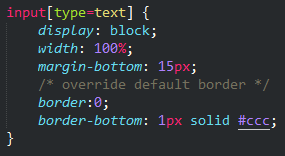 Next, we’ll modify the CSS rules to make the <div> elements the parents of the pseudo elements and trigger hover effects, rather than the text input elements. The effect works well now but the markup has become somewhat bloated as a result of the additional wrapper divs. This presents us with a dilemma, since it’s considered best practice to avoid the overuse of the <div>, yet nesting an empty element in a container appears to be the only means of achieving the desired effect in this case. This is the solution I ended up implementing. Of course this is a compromise, as it does not completely achieve the desired effect. To conclude, I’ll address the question posed in the title of this article. While it is certainly possible to style form inputs with pseudo selectors by way of the workaround I noted above, it is probably not a good idea to do so in the interest of semantic structure. Daniel Pierre on Styling forms with pseudo elements: can it be done?